Water Clarity: Clear, with visability to 10 ft.
hard surfaced ramp; parking for 10 vehicles. Approximate Driving Time Downtown Chicago: 1.5 – 2 hours. 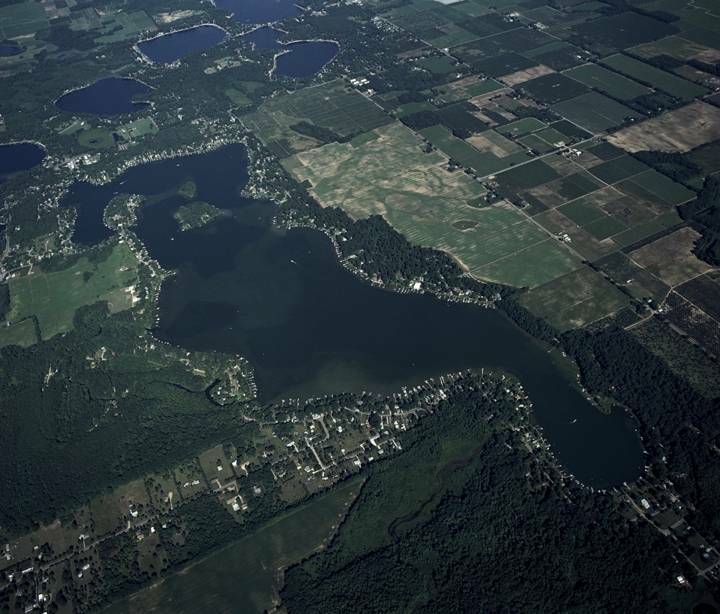 Magician Lake is the largest of several lakes that are located along the Cass & Van Buren County line at the western end of the counties. This beautiful lake is often referred to as “magical” because of its allure, a respect accounted for by its sandy bottom. Most other lakes in the area have a muck bottom. Its proximity to Chicago and Interstate Highway I-94 have caused it to become a favorite recreation spot for many Illinois and Indiana residents. A generous state owned public access site has not detracted the fact that Magician Lake is mainly used by the owners of shoreline venued private homes. Most former resorts have become private. Like most of southwest Michigan’s larger inland lakes many older cottages have given way to newly constructed larger homes, with many occupied year around. Considerable reconstruction activity is apparent and land values continue to escalate at proximate double digit rates.